Step Up to the LEVEL NEX SUV! Advanced HARMAN infotainment system enabled with a drive mode-based HMI theme. 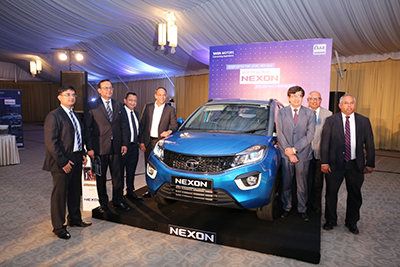 Tata Motors, along with its distributor, Diesel & Motors Engineering PLC (DIMO) announced the launch of its most stylish compact SUV, Tata Nexon in Sri Lanka, today. The Tata NEXON is a revolutionary design of “breaking the box” with an aerodynamic silhouette. This enhances its sporty character and marks an evolution in SUV design by combining the functionality of an SUV with style of a sports coupe. Founded in 1939 as a purely automobile sales and repair concern, Diesel & Motor Engineering PLC (DIMO) has since grown as well as in scope of activities. Diesel & Motor Engineering PLC (DIMO) currently has over 1750 employees as at March 2018 with an annual turnover of Rs 43.6 Billion (2017/2018). DIMO has a record of almost 80 years of experience in the automobile and engineering industry. Over the years, the company has made significant contributions towards the development of infrastructure development and road transportation in Sri Lanka. From a company known for vehicles, DIMO today has diversified into many areas. Medical Engineering, Building Management Systems, Power Generation and Distribution, Material Handling, Storage and Warehouse solutions, Power Tools, Agricultural Equipment, Total Lighting Solutions, Power Systems and Generators, Refrigeration, Ship Repairing and Driver Training Courses are some of the areas into which DIMO has entered during the past few decades. DIMO is currently looking beyond Sri Lanka to expand their operations and have also gone into fertilizer and seeds industry locally. More information can be found at www.dimolanka.com and at www.facebook.com/DimoSrilanka.